and encourages Jacky enormously. 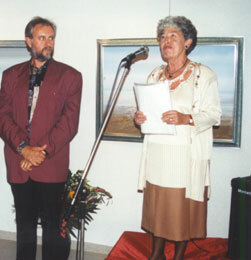 Mrs Gallant , friend of Geert Van Bruane who helped Magritte , Metens and other surrealists, presents himself as the first Maecenas in Jacky’s career and funds the reception. Jacky recites also some of his poems in the packed bar. Cultural Centre “Oasis” at the Royal Air Force in Evere ( Brussels ). Meeting Centre “ De Kroon ” in Sint-Agatha-Berchem. 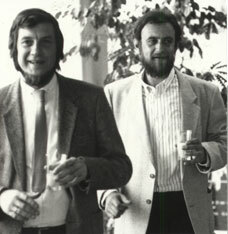 Hugo Weckx, then chairman of the Flemish Culture Commission in the Brussels agglomeration, and author Willem M. Roggeman inaugurate the exhibition, presenting some monotypes, which had never been exposed before. Dr Joost Proesmans organizes an exposition in Roosdaal-Pamel. First exposition in his studio (29-30th of June ). Cultural Centre “Kapel” in Boondaal. “ Art at School” in Institute Regina Caeli in Dilbeek, organized by Denise and Michel Myttenaere . The Cultural Centre in Schaarbeek ( Brussels ) holds an exhibition, organized by J. Anthierens . « Studio Open Door » days (May-June). 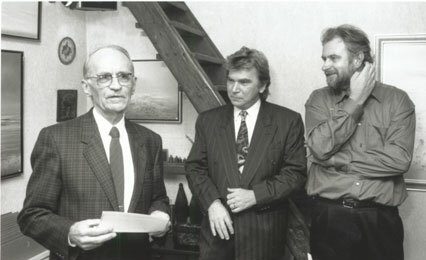 Gallery “Westrand” in Dilbeek, introduction by Pieter G. Buckinx, Erik van Ruysbeek and Frans De Craen . International exhibition “Fantasmagie” in Gallery Luka in Boechout. 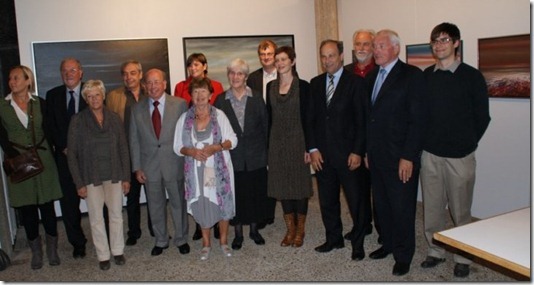 Selection Painting Award from the city of Ronse . Gallery Cassandra – Zeedijk in Ostend (1st till 15th of July), introduction by Hugo Brutin – on this occasion Jacky meets Prince Karel of Flanders, who visits the exhibition. Nekkersdal in Laken ( Brussels – 19th till 28th of May), introduction by Hugo Weckx, Ferdinand Lefere, Vic Anciaux and Willem M. Roggeman. Some of Jacky’s works are selected for the collection “Kunst in Huis”(Art-to-Rent project) in Hasselt , Waregem, Knokke, Turnhout and Dilbeek. A selection of his work is used for the exhibition “Pajottenlands Palet” in Gallery “De Tinne Pot”, organized by a Belgian bank (KBC). 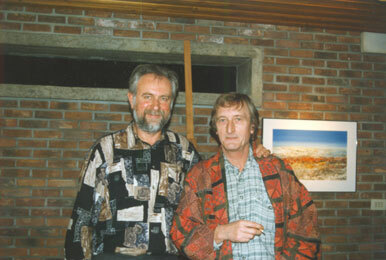 Exhibition in his studio in Dilbeek (November-December). Expo-selection “ Brussels ’ Aquarellists” in Gallery “De Tinne Pot” in Brussels (March). Expo-selection “Kleur en Lijn” (Colour and Line) in the foyer of the theatre K.V.S in Brussels , organized by “Kunst in Huis” and “Friends of Caryatide”. 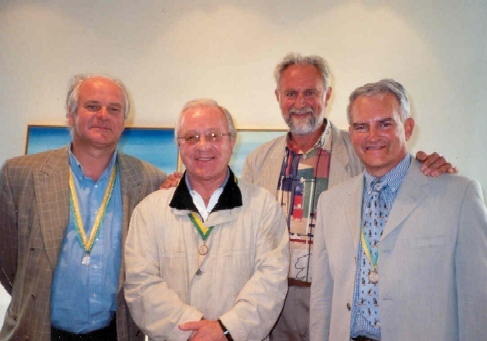 Together with André Van Laere , he exhibits in the medical practice of Dr. G. Henne in Bergisch-Gladbach Germany (24th of May – 22nd of June ) – Introduction by André Van Laere . Gallery “Mylène” in Heist-op-den-Berg, introduction by Roger De Neef and Juul Anthonissen . An exhibition of apocalyptic and cosmic landscapes displayed within an/the expanded and renovated studio. Introduction by Willy Juwet on the 5th of December. “Provincial Beguinage” in Hasselt – Paintings acquired by the State 1978-79. 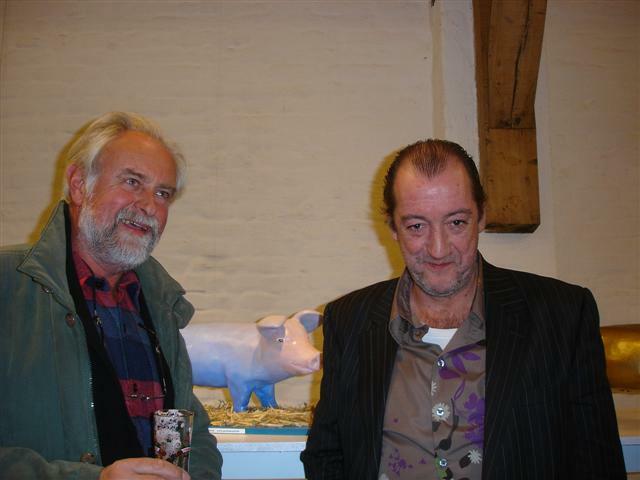 100 artists exhibit for the benefit of “ Ons Tehuis – Brabant ” in Ham Castle in Steenokkerzeel. ”Contemporary Artists in South Flanders” – touring exhibits from the Ministry of the Flemish Community held in the city theatre of Kortrijk, Wortegem-Petegem, Herzele, Galmaarden, Avelgem, e.a. 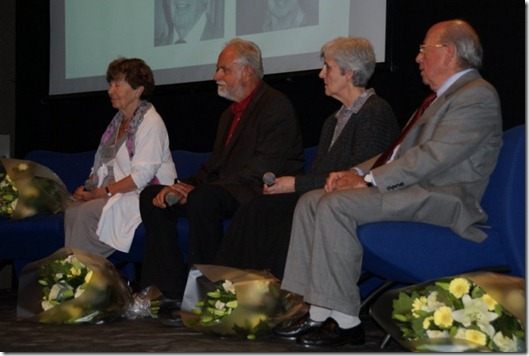 University faculty Sint-Aloysius Brussels at the occasion of the academic year opening. 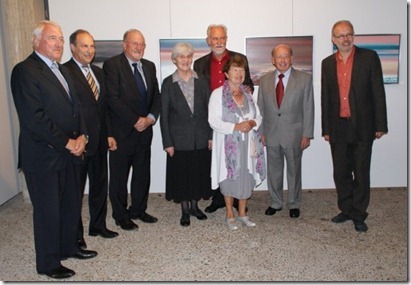 Gallery “Westrand” – introduction by Wim Van Gansbeke . “Faculty Club” in Leuven – introduction by Ward Boon . “Haagse en Brusselse Aquarellisten ” (Aquarelists from The Hague and Brussels ) – Pulchi Studion The Hague, requested by Gallery “De Tinne Pot” – Kredietbank. ” Vlaamse Kunstenaars te Brussel” (Flemish artists in Brussels ) in“ Hoger Rijksinstituut voor Vertalers en Tolken » te Brussel. 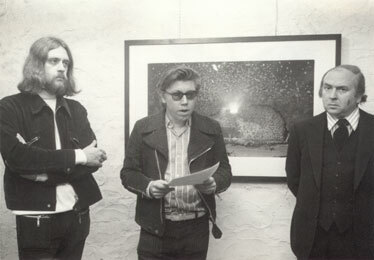 Together with Tom Payot and André Van Laere in Gallery “Het Goudblommeke van Papier”, introduction by Emile Kesteman and Brigiet Tyteca. ” Vlaamsbrabantse Kunstenaars ” (Flemish Brabant Artists) in H. Vander Stokken Centre, Pepingen. 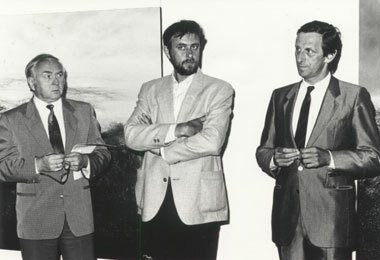 Gallery “Carloo” in Ukkel ( Brussels ), introduction by Hugo Weckx , chairman of the N.C.C., in the presence of Felix De Boeck . Academic hospital Sint-Rafaël in Leuven . Foyer of the K.V.S. theatre – “Caryatide in Brussels ”, introduction by Madeleine Sergooris (BRT2). 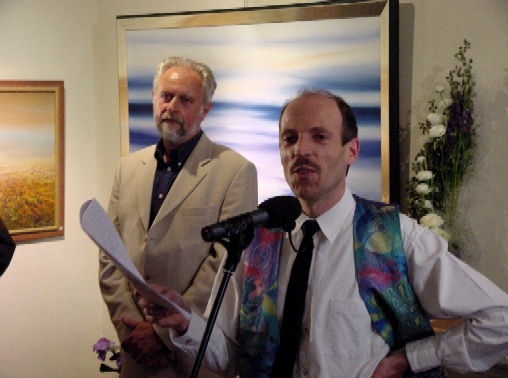 Exhibition in Jacky’s studio accompanied by a poetry recital by Brigiet Tyteca and André Van Steyvoort . “Stellingen van Jonge Brusselse Kunstenaars ” (Assumptionsof Young Brussels Artists) in the New Workshop Gallery in Brussels . Patio of the BRT (Belgian Radio and Television) in Brussels – Introduction by Wim Van Gansbeke . Gallery New Selection in Mechelen, introduction by Remi de Cnodder . Meeting centre “ De Zeyp ” in Ganshoren, with poetry recital and numerous visits by schools. Introduction by Hugo Weckx and Jan Beghin . Selection for “Kunst in Huis” in Gallery Herman Teirlinck in Beersel, introduction by Willy Juwet . 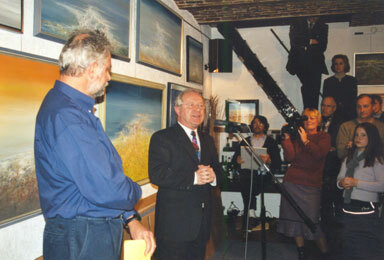 Gallery “ Herman Teirlinck ” in Beersel, introduction by Bob Elsen . Gallery “Home” in Vilvoorde, introduction by Willem M. Roggeman and Gilbert Putteman . “ Ancienne Belgique ” in Brussels , introduction by Ivo Goris , in the presence of Maria Farandouri . 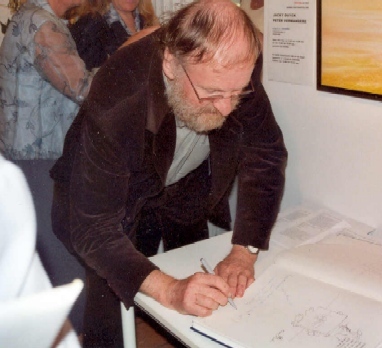 Exposition in Jacky’s studio showing drawings and aquarelles made in the Provence ( France ), introduction by Willem M. Roggeman . Gallery “Pro Monotype” in Brussels displaying a selection of original monotypes. Gallery “Artypo – Kunst onder de Toren ” in Veurne, with musical accompaniment supplied by Kristien Dehollander and Alfred Den Ouden . 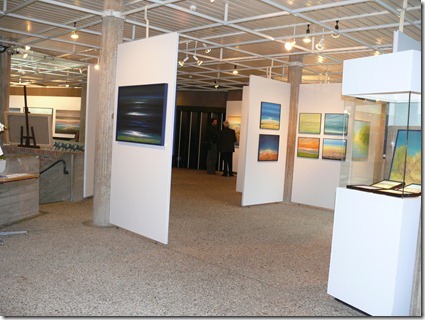 “National Award for Aquarelle” in Gallery “De Tinne Pot” in Brussels . Gallery “Het Goudblommeke van Papier” in Brussels , with “Homage to Emile kesteman”. “Oasis Extra Muros 1” in Opheylissem. “Oasis Extra Muros 2” in the Casino of Koksijde. 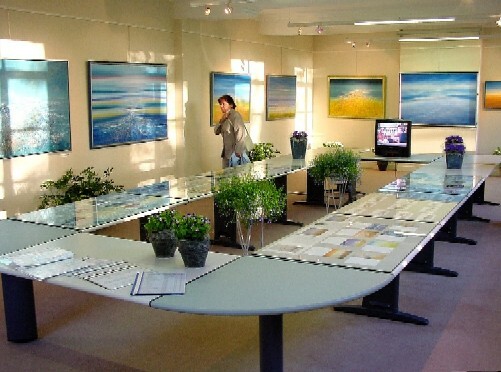 ”Aquarelles and Gouaches” in the Cultural Centre of the Royal Air Force “Oasis” in Evere ( Brussels ). “Integratie” (Integration) Award in Koksijde. 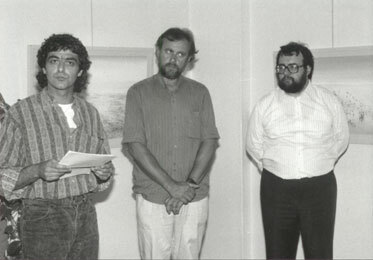 ”Prijs voor de Schilderkunst ” (Artistic award) in Doornik (selection). Faculty-Club “Groot-Begijnhof” in Leuven – introduction by Edward Boon . B.K.T. 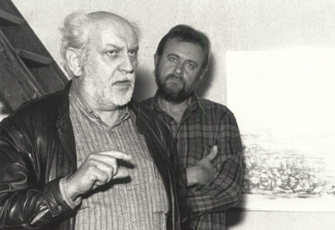 Kapellemarkt in Brussels , introduction by door Rudi van Vlaenderen and Hugo Weckx . “Town of Dilbeek ” in Atlanta U.S.A. during the “Belgian-American Week”, under impulse of Dr. Jef Valkeniers . “Oasis Extra Muros 3” in the Cultural Centre of Sint-Truiden. “Oasis Extra Muros 4” in Palais des Congrès in Luik. “Pré aux Sources” in Sint-Lambrechts-Woluwe ( Brussels ) displaying lithography’s. Gallery “New Selection” in Mechelen. “Kunst in Huis te gast in de KB” in the Farmer’s Tower of the KBC in Antwerp . “Kunst in Huis” in the Westrand Gallery in Dilbeek. 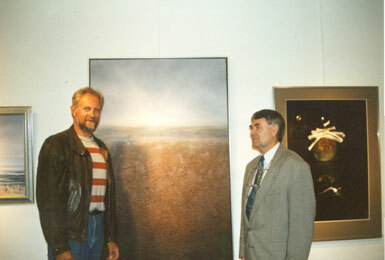 “De Kunstvrienden van Willem M. Roggeman”, in the Westrand Gallery Dilbeek, together with Pol Mara, Maurice Haccuria, Bram Bogart, Paul Van Hoeydonck, Roland Monteyne and others. 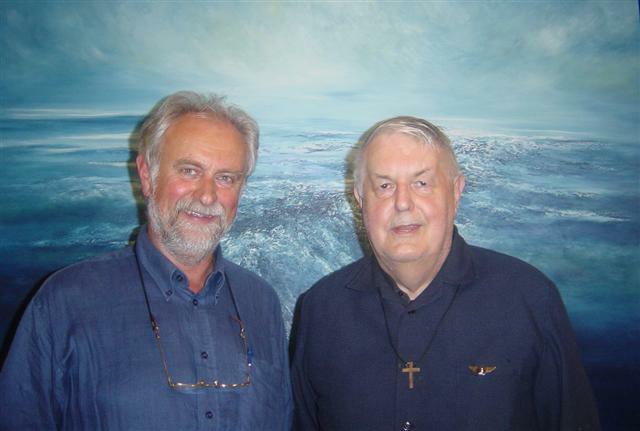 “Contemporary Religious Art in Flanders ” in Groot-Begijnhof Faculty-Club – Leuven as part of the Pope’s visit. “International Graphic Art ” in “Groot-Begijnhof Faculty-Club” in Leuven . “Greenpeace” in the Herman Teirlinck Gallery in Beersel. Westrand Gallery Dilbeek, introduction by Rudi van Vlaenderen . Saint-Paul-la-Coste (South of France), exhibition of eight large drawings of the Cévennes in pencil and bister; these drawings are printed in limited edition as an art folder by Malaika-Artigraph and published by Van Cutsem-De Postiljon. Alès (South of France): drawings from the Cevennes . “Zomer Salon 1986” in Gallery “Montjoie” (Zavel) in Brussels . “Serialiteit in de Hedendaagse Kunst” in cultural centre “ A. Spinoy ” in Mechelen. 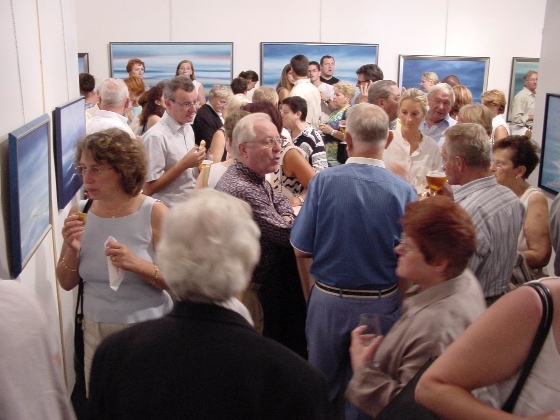 “10 years Cultural and Art Council in Dilbeek” – art happening in Westrand Gallery in Dilbeek. “Tangent lines of the light” in B.B.L. Leuven, a homage to poet Erik van Ruysbeek. “Expressionism II” in the Nederloo Castle in Vlezenbeek. “Artists from Pajottenland” in Cultural Centre Westrand in Dilbeek, by Kiwani’s Dilbeek. 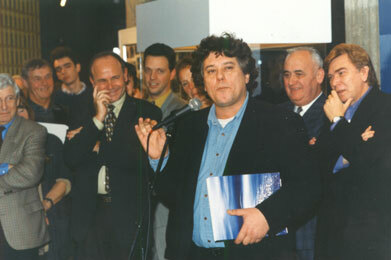 Actor - director Rudi van Vlaenderen inaugurates the exposition in the studio in December 1998. Educational exhibition ” Art to children’s size” at the meeting place De Zeyp in Ganshoren, with a youth drawing competition. Guest of honour at the International Art Expo (Salon du Printemps) in Luxemburg , organized by the Letzeburger Artisten Center , and in Gallery Blaupunkt in Luxemburg , introduction by Michel Myttenaere . Meeting centre De Zeyp in Ganshoren, introduction by Jan Beghin . On this didactic exhibition, Jacky welcomes many schools for courses and demonstrations. “Oasis Extra Muros 11” in the Cultural Centre in Oudergem. Educational exhibition ” Art to children’s size” in the Meeting centres Essegem in Jette and Maalbeek in Etterbeek ( Brussels ). Town Hall at De Panne , introduced by Ivo Goris . Cultural Centre De Schakel in Waregem, introduction by Ria Merlier and Lily Banck . “5 x Materie ” in Westrand Gallery in Dilbeek, with Jos De Maegd , Lucien Van den Driessche and others; introduction by Willem M. Roggeman . 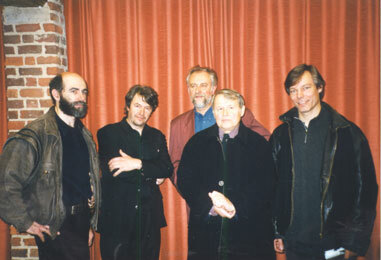 “Homage to the 1000-year Church in Russia”, together with Felix de Boeck, Dan Van Severen, Gaspard De Vuyst and others in the Museum of Religious Art in Ostend. "20 years Studio in Dilbeek" with Open-Studio-Days, introduction by Zaki and André Van Laere . Gallery” Het Labyrint ” with Stef Dehollander in Kemmel, introduction by Dirk Clement. At the Gaasbeek Castle , together with André Van Laere ; introduction by Herman Vandormael . ”Montjoie” Gallery (Zavel) in Brussels . Provincial Institute for Culture “Dommelhof” in Neerpelt. Official opening Hotel Donny of the family Deconinck-Nevens in De Panne . Open Studio days in Dilbeek, introduction by Gilbert Putteman . “Graphics, Art as no other” in the Abbey of Grimbergen. “Backgrounds” by Kunst in Huis in Cultural Centre Westrand in Dilbeek. 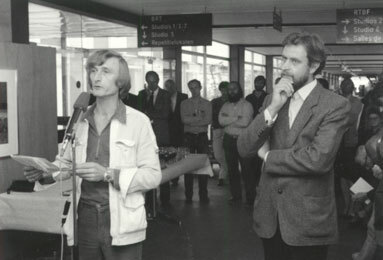 "Hommage to Jacky Duyck 1973-1993" in Meeting Centre De Kroon in Sint-Agatha-Berchem, introduction by Hugo Weckx, Flemisch Minister of Culture and Brussels Affairs, in the presence of Willy Juwet – General Director Ministry of the Flemisch Community. Universitair Ziekenhuis Gasthuisberg in Leuven . Together with André Van Laere in the Sint-Goedele cathedral in Brussels , at the occasion of 700 years Ruusbroeck, inthe presence of Cardinal Danneels . “Graphics, Art as no other” in the Abbey of Grimbergen; introduction by Gilbert Putteman . Abbey of Grimbergen. Abbey of Grimbergen. “Hulde aan Remi de Cnodder” in Antwerp Congress centre ‘t Elzenveld. Cultural centre " De Ploter " in Ternat – introduction by actress Alice Toen ..
Open-Studio-Days at the occasion of the expansion of Jacky’s studio in Dilbeek. (May and December). “De grootsheid van het kleine” in Kunstforum-Galerij in Schelderode. “Licht creëert sfeer” by Elma-Obreg in Brussel. 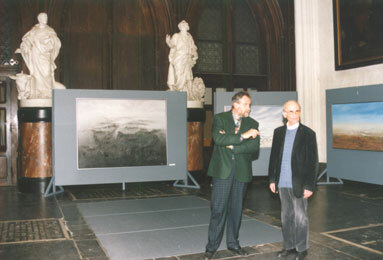 "... nu tussen vroeger", together with André Van Laere in the Cathedral in Antwerp. Open-Studio-Days at the occasion of the expansion of Jacky’s 2nd studio. ( June and December). ”Paintings acquired by the Flemish Community 1994-1995” for the Muhka Museum of Contemporary Art in Antwerp . 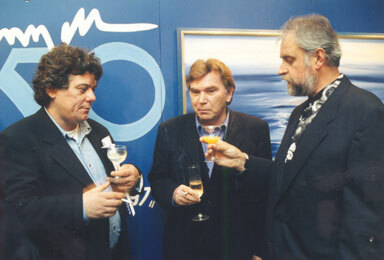 Opening speech at the exhibition "Jacky Duyck 50" in C.C. 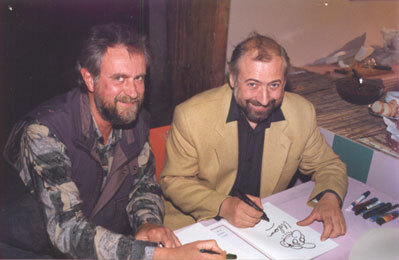 Westrand in Dilbeek by Johan Verminnen and Zaki, on the 21st of November 1997. 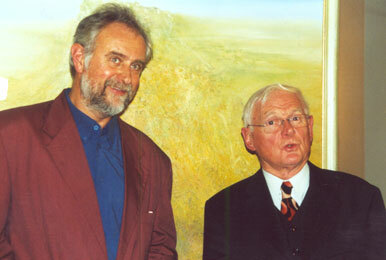 “Van wit doek naar schilderij” 30th of November 1997: an interview with Wim Van Gansbeke. “Postmodern Pajottenland” in Dilbeek, Ternat, Galmaarden, Sint-Pieters-Leeuw, Halle and Grimminge. Kiwanis organisation Zaventem in the abbey of Grimbergen(April 21-22). Introduction by Gilbert Putteman . 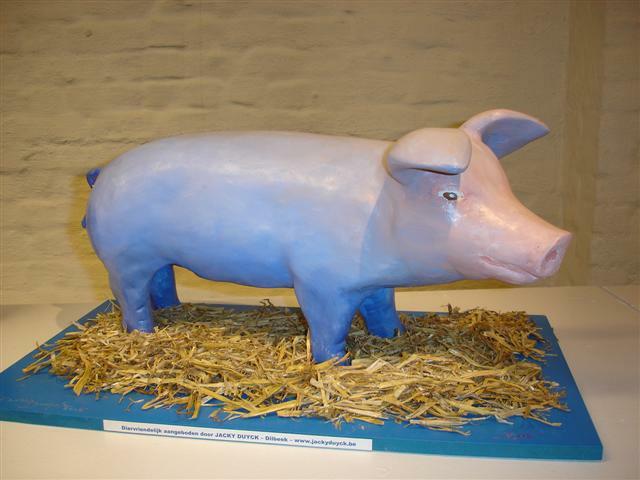 Jacky’s expo in the Abbey-Farm in Koksijde “ Ten Bogaerde ” (June 19 – July 5) attracts great public interest. Introduction is held by alderman Herwig Vollon and cabaret artist Karel Declercq ; opening by mayor Marc Vanden Bussche .Exhibition as part of the project “ Een Duyck in de kunt” at the national centre for contemporary youth “ Eigentijdse Jeugd ”. Cultural Centre “De Oude Pastorie” in Kapelle-op-den-Bos(Nieuwenrode) from the 26th of November till the 19th of December. Exhibition including cartoons and caricatures made for Jacky Duyck by Luc De Maeyer, Miel De Bolle, Brasser, Karl Meersman and Urbanus. Opening speech by Jef Burm. Large exhibition in his studio “1970-2000”, accompanied by celebration “30 years JACKY DUYCK studio” in Dilbeek. Introduction by Walter Capiau. Didactic exhibition held his studio where Jacky welcomes numerous schools, groups and associations for a tour and introduction in the techniques of drawing and painting. 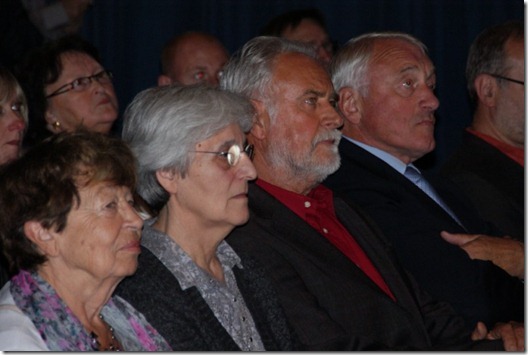 At the occasion of “25 jaar Vlaamse Federatie van Verzorgenden”, an exposition is held in Haasrode (Brabanthal). Contemporary art exhibition “Actuele kunst uit het Pajottenland-Zennevalei” in Ter Waesbroeck-Coovi-Elishout (Anderlecht 23rd of March). Kiwanis organisation Zaventem in the abbey of Grimbergen(April 21-22). 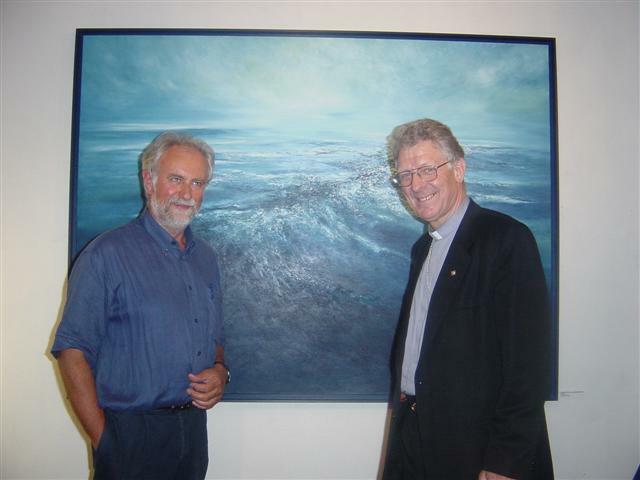 ”Open Garden Day” in his studio, displaying a selection of his recent work and a special “homage to “Brasser”. Invitation to “Peterschap van kunsthappening” of the exposition in the exhibition room of Toyota in Anderlecht . Introduction by Walter Vandenbossche . Expo in the castle C.C. Coloma in Sint-Pieters-Leeuw (May 25 – June 9). 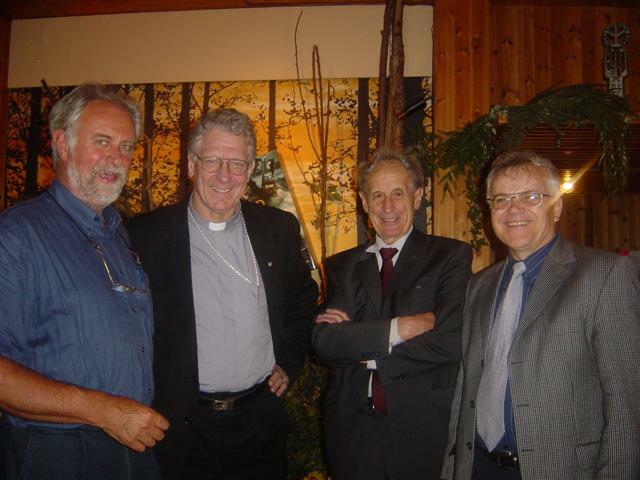 Exhibition together with Peter Vermandere (sculptures) in “Keunekapel” at Sint-Idesbald, with introduction by Walter Capiau. 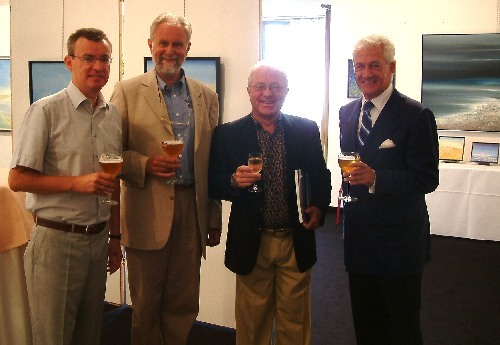 Exhibition in the Casino of Koksijde (7th till 22th September) with introduction by Hugo Brutin. 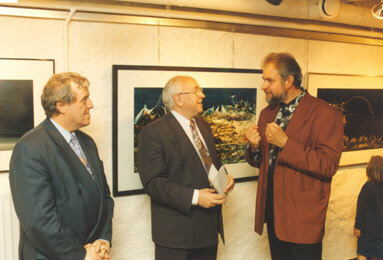 Permanent exhibition in his studio. Jacky welcomes your visit by appointment. Abbey of Grimbergen, organisation Kiwanis Zaventem (26 and 27 April). Visits in the studio and expositions in cooperation with “Open-Atelier” on 12, 13, 14 and 15 December 2003 with a selection of recent work. Exhibition in gallery and studio of Rogianne Gaytant in Beauvoorde, from May till September. Big exhibition in the National Centre “Eigentijdse Jeugd” in Dilbeek from June till September, opened by Mgr. Luc Van Looy. Mgr. 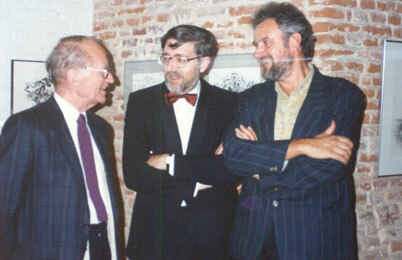 Luc Van Looy, Godfried Lannoo and Piet Palmans. Herman Boon (chaplain airport Zaventem). 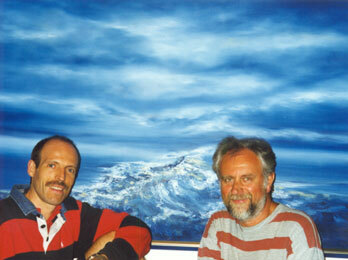 Exhibition in his studio with recent paintings, drawings, new pastels and water colors. – Exhibition in Jezus-Eik (Overijse) at “De Bosuil” from 3rd till 18th of June. Introduction: Alice TOEN. – Open-Art studio Days on 2-3-9-10 December. 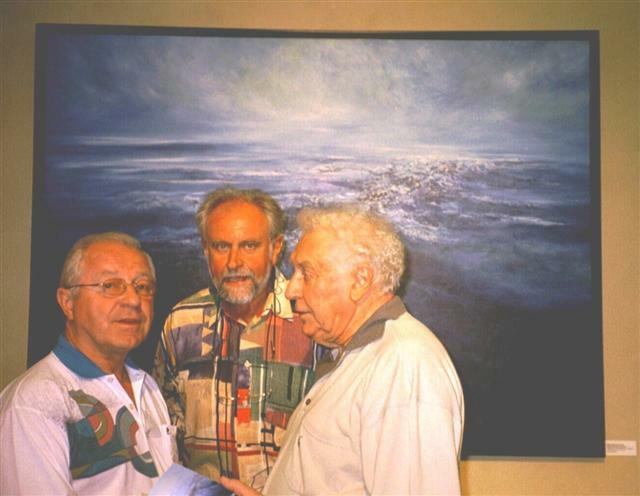 Large exhibition ” Jacky Duyck at the seaside” in the “Casino of Middelkerke” with a lot of new paintings, during the whole month of August, at the occasion of his 60th birthday. 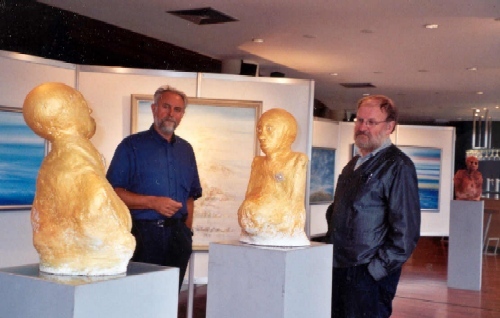 Van Craenenbroeck with paintings and sculptures. Introduction by Guido De Padt, deputy of culture and opening by Freddy De Chou, mayor of Geraardsbergen. Mr. Jean-Luc Vanraes, chairman of the “Raad” and introduction by Mr. Walter Vandenbossche, chairman of the cd&v fraction of the Brussels ‘ Capital Parliament. Open-Art studio on Sunday 9th of December. Beatrice Van Baelen and Marie Ange Demuysere. – Open-Art Studio Days on December 5, 6, 12 and 13. – Invited by Bang & Olufsen in Halle for a unique exhibition with 25 recent paintings as well as 130 paitings shown on a large television screen, from 17 till 26 October. – Comprehensive exhibition in the art studio of the artist on 23, 24, 30 November and 1 December. – Unique exhibition of paintings “under water” in Dilbeek, at the occasion of 40 years celebration of the swimming pool “DILKOM” in October.